Nature’s Table was a tiny health food restaurant/jazz club run by Terry Masar in Urbana, Illinois from 1979 – 1991. It offered good food, excellent music, local art on the walls and a gathering place for the artistic community for a decade. It was conveniently located on Goodwin Street, right across from the University of Illinois Krannert Center for the Performing Arts, where many music students studied during the day. They would play at “the Table” at night. People gathered there to eat Gondolette sandwiches or a $1 bowl of red beans and rice, talk about all things important to the community, and take in the incredible music. People were encouraged to experiment and be creative; the Table nurtured many a budding artist, musician, cook and free thinker. Driving past the Table on a hot summer night, passersby would see a packed house through the windows, numerous people gathered on the front steps, peacefully enjoying food, drink and conversation, and incredible music wafting out the front door. It was a warm and inviting place; you just wanted to hang out there. While Nature’s Table pulled in all sorts of national talent (including jazz greats Von Freeman, Herb Ellis, Richard “Groove” Holmes, Peter “Madcat” Ruth and Jon McNeil, among many others), it was the home of alternative local music: jazz, blues, alternative rock and bluegrass. A very young Alison Krauss played there many, many times; yes, she blew everybody away even as a young teenager. Nature’s Table was, unfortunately, build on land owned by the University, and in 1991, the University decided they wanted the land. 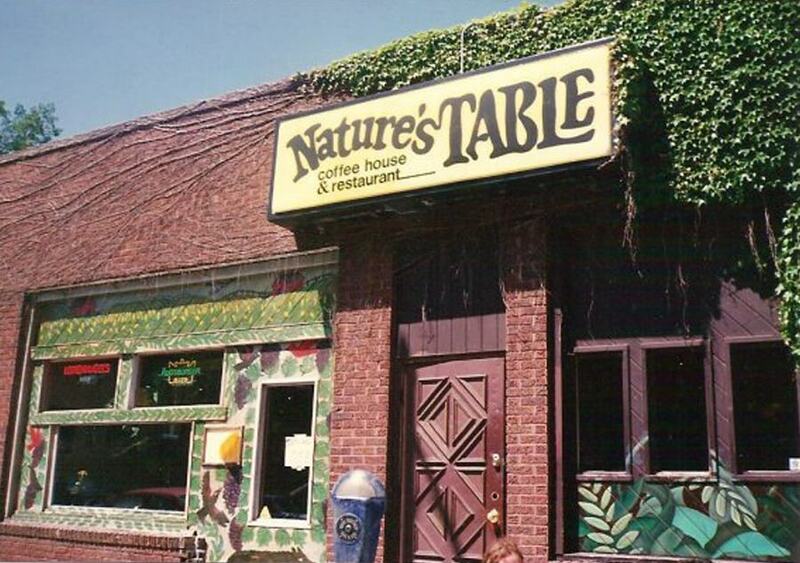 Nature’s Table was forced to close to make way for another building dedicated to higher learning, unaware of all the higher learning that had been going on at that spot for the last eleven years. Numerous Nature’s Table reunions have taken place in the past several years, further proving what a lasting impact the Table had on the community at the time. It was a true community resource, and it is still missed today. Terry Masar died in October 2011.